This is my fourth (and maybe not final) Tasty Tuesday from the January 1978 Workbasket Home Arts Magazine. My previous three posts: Cottage Cheese Crumb Cake, Chocolate Dessert, and Banana Dessert were all good…but I am most excited about this one. I’m going to start by saying, it’s my birthday and I want chocolate! And since I’m in charge of my own cake, this is what I’m making! I don’t know WHY, I ended up pulling so much butter out of the fridge…the recipe only calls for 3 tbsp. Start by sifting flour. I don’t have a fancy sifter, therefore I used a fine mesh strainer. No fancy sifting tool? No problem! 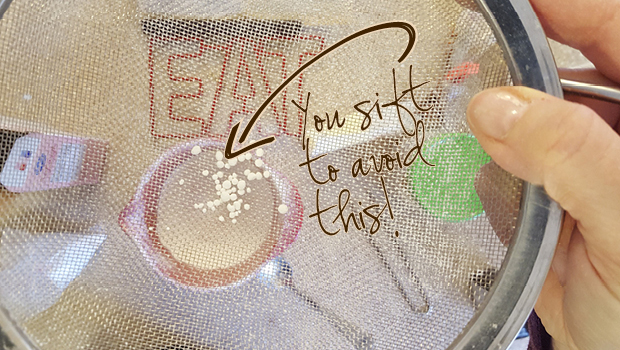 Use a fine mesh strainer…even if it breaks in the process. 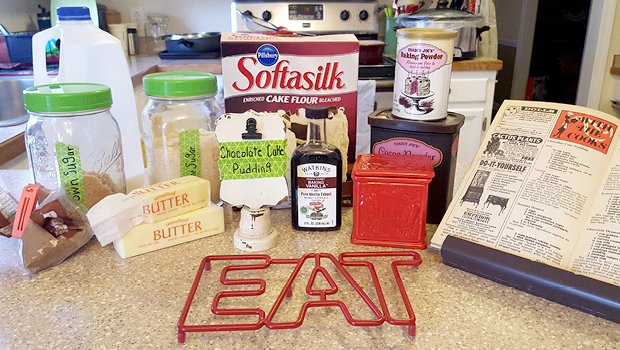 I used cake flour—mostly because I had it—if I hadn’t, I would have used all-purpose. 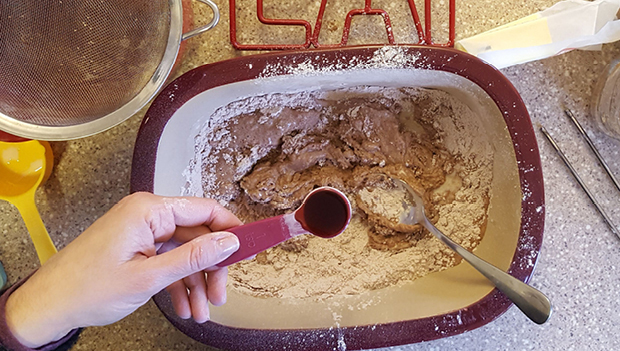 The recipe calls for it to be sifted AND because it’s cake flour, it needs to be sifted. Cake flour is milled to a finer consistency than all-purpose flour and thus more prone to lumps. 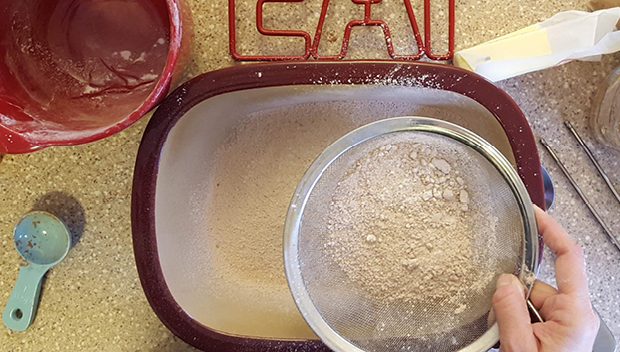 Cocoa powder also has a tendency to get lumpy so, strain it too. 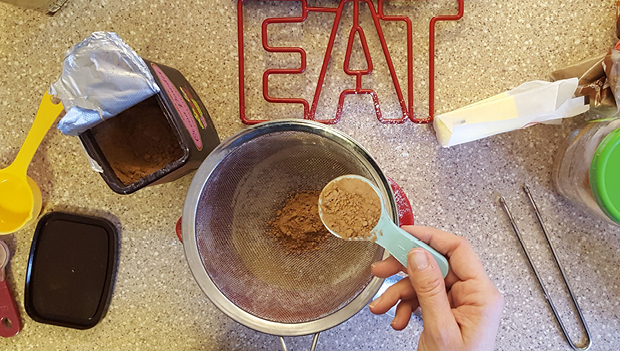 Sift the cocoa to avoid cocoa lumps. Add remaining dry ingredients: sugar, salt, and baking powder. Give the dry ingedients a mix. Now more sifting. Sift the mixed dry ingredients into the baking dish. The recipe calls for a 9-inch square pan, however, I was in tears this morning looking for mine and couldn’t find it. Now it’s time for the wet stuff: milk, butter, and vanilla. 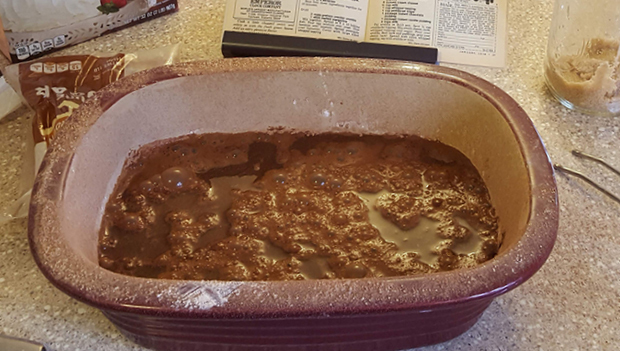 Mix in the baking dish…why? Say it with me, cause I’m kinda lazy! Make sure you do a good job mixing, corners can be places where dry ingredients like to hide. Spread it to a nice even layer. 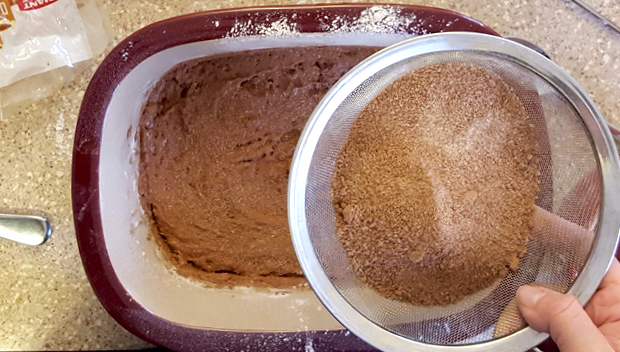 Mix dry topping ingredients: sugar, brown sugar, and cocoa powder. Sprinkle over the batter. 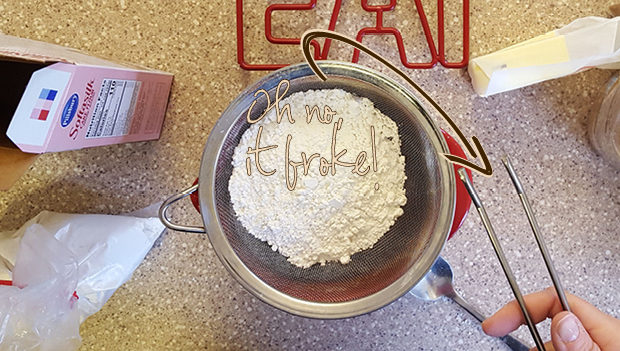 I chose to use my strainer, because…again, I’m lazy: yes. But also, it’s kinda fun to sift it. Hot coffee or water is the final ingredient. 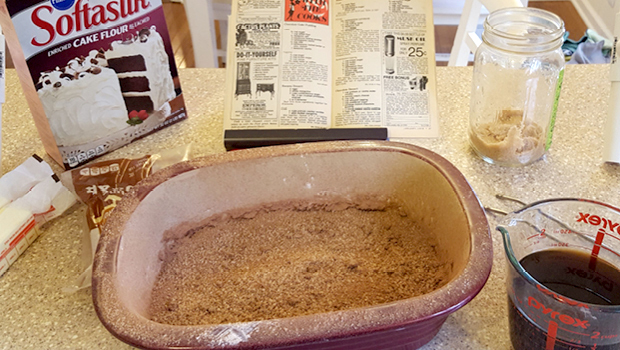 Two more steps: pour and bake. Pour your liquid of choice (water or coffee) over the whole thing. This seems weird, yes, but I have come to just have faith in these recipes. They have all turned out well…even the hot dogs, fruit cocktail and rice one—I should make that again soon. P.S. I’m serving with whipped cream, although I will try one with sour cream. A recipe from the With The Cooks feature in the Workbasket Art and Home Magazine, January 1978. 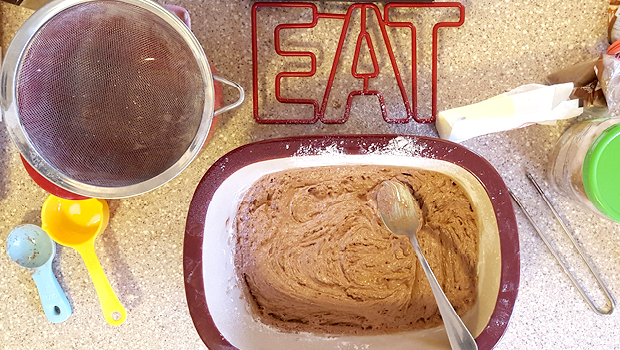 Sift sugar, flour, salt, baking powder, and cocoa in a greased 9-inch square pan. Stir in milk, melted butter, and vanilla. 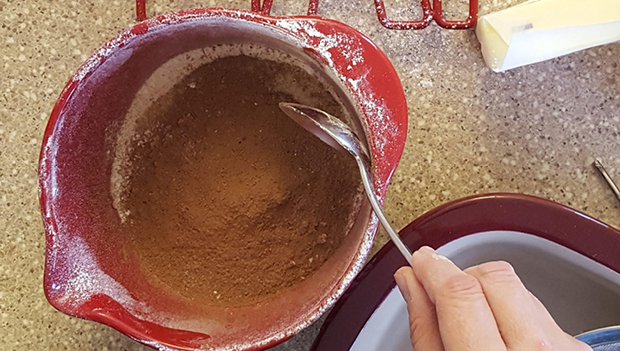 Mix topping sugars with cocoa powder, sprinkle over batter. Pour water or coffee over the cake mixture and bake at 350º for 45 minutes or until top springs back when lightly touched. Serve warm or cool with whipped or sour cream.